We are still getting settled in our new home. I have a feeling it will take a while. I’m completely exhausted from the move and am having a difficult time accomplishing much of anything right now. But I’m trying to be kind to myself because obviously, I need a break. Pushing myself when my body says “no” never really works out for me. I’m learning to listen. So while I’m taking a little down time, I thought it would be fun to get my mind off of some of the more difficult things in my life right now and focus on something a little more fun. Something for Halloween. As some of you know, I’ve been working with eBay on creating content for their website. My first round of content was all about summer and Back To School recipes. But I thought it would also be fun to try something a bit different this time around. This second round of articles will include projects and recipes for the holidays! 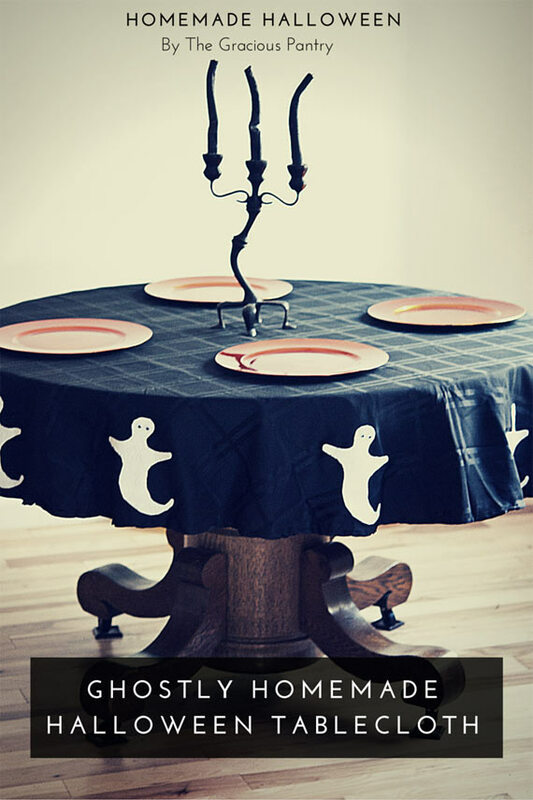 This fun little DIY Ghostly Halloween Tablecloth was a great project for me and Mini Chef to work on together. It’s a quick project too and it makes any table you put it on look darling! Plus, the instructions will work for any size table!